As any homeschool mom can tell you, there just aren’t enough hours in the day to get it all done. You are busy! And while you do have good intentions and want to read aloud to your children, there is always something getting in the way. Science experiments, busy toddlers, meal prep. You know how important it is, but it just never seems to happen. Don’t give up! 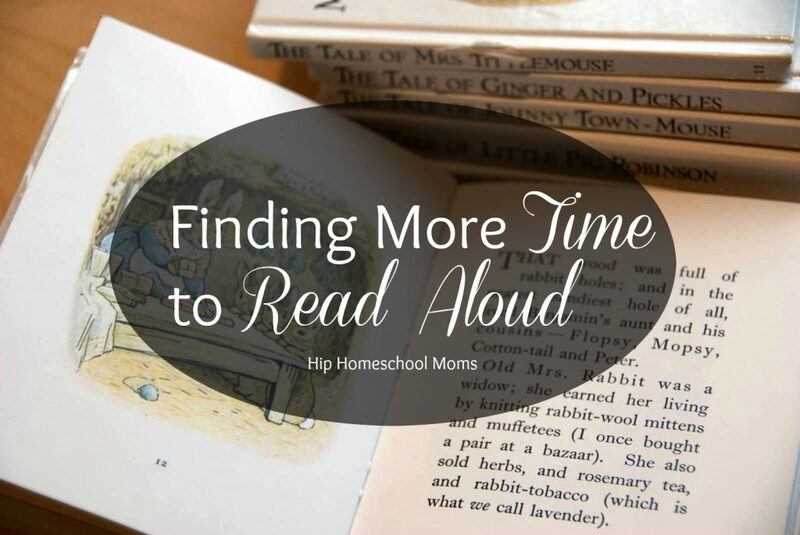 Today I’m going to share with you some ideas that will help you squeeze more reading aloud into your homeschool and family life. I know that some homeschoolers spend literally HOURS a day reading together. I think that’s great! But maybe when you hear that, you are overwhelmed at the magnitude and wonder how that would ever be possible for you. Maybe you feel you can’t even manage 30 minutes between your mischievous toddler, crying baby, and math lessons. Here’s the thing though: you don’t have to spend 2 hours a day reading aloud for it to be worthwhile. If you spend as little as 15 minutes a day reading to your children, it will amount to over 90 hours a year of bonding, memories, and language learning for your children. That’s nothing to scoff at! Read for shorter periods of time more often. This is what is working for us right now — we break our reading aloud up into at least three chunks. It works great because my current challenges in this area include the short attention span of my 5-year-old, and my fussy/mischievous/acrobatic toddler. So we are reading aloud at the start of our day, after lunch, and at bedtime. Anchor a read aloud time to another activity. If you are constantly meaning to read aloud but not managing to get around to it — tie it to another activity that always gets done. One option is during mealtime. Everyone eats, right? Then make read aloud time part of lunchtime (or breakfast/dinner)! We ALWAYS have quiet time after lunch (and go to bed at night!) so we make that a part of the regular routine when we do those activities. If you make reading aloud something you are planning on doing whenever you find the time, you may just never find it. Make use of audio books. Audio books are a great asset to reading aloud — and it’s not cheating! There are some wonderful audio books available, and they are perfect for when you want to give your voice a break, are unable to read aloud yourself, or if you don’t even like reading aloud. We have been known to listen during lunch (less bickering at the table is also a plus! ), during quiet time, on family trips, and during our almost daily car trips to and from our regular activities. This is a great way to redeem time that is otherwise wasted on the road! Have older siblings read to the younger. This one is really special around here! I know I struggled with some regret over not having the opportunity to read as much to my little ones as I read to my older one when she was small. Back then, I had only board books and picture books to read aloud. Now, with a 6 year span between the oldest and youngest, I feel that the littlest one gets the short end of the stick in this regard. So if I’m already reading as much as I can, how can my little ones get enough for themselves? Easy! I have my oldest (who is a fluent reader) read to her siblings! There are two bonus benefits to this arrangement: relationship building between siblings, and read aloud skill building for the oldest. This is the tough one though, isn’t it? I know it sure is for me. It is hard to calm my anxious heart and put reading ahead of our more formal book work. But you know what? The research doesn’t show that memorizing addition facts by age 7, learning to read at 5, writing neatly, or acing a spelling test will contribute to your child’s future in the way that being read to will. So make time for reading, however much time you have! Alison is a Canadian homeschooling mama to three sweet girls. 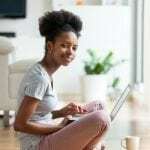 She views homeschooling through the lens of discipleship, education as a lifelong endeavour, and is thankful that she can begin each day anew by the grace of God. She writes about homeschooling, faith, and family life over at her blog Learning Mama. You can also find her on Facebook and Twitter. We call it couch time too!